I was never one to crave worldly possessions, for me exotic travel, enriching life experiences, tantalizing food trails, are my objects of desire; and yet I found myself wishing I had a particular bag. Not a hermes, but Hermione’s bag. That purple beaded bag, which was just a nifty sling bag but which held all assortment of stuff for her two friends and her, from clothes, to shoes, socka and even an invisibility cloak. I have never wished harder for the power of the undetectable extension charm, than when I was packing for baby foodies first international travel. We are travelling with my 14 month toddler babyfoodie, and having myself and everyone around me up the wall, I finally have written down my packing essentials, in the hope it will help other travelling moms. While packing can be daunting, I divide it according to the toddlers day which is , eat, poop,play, bath time,sleep. a.Travel food : small knick knacks, I am carrying home made carrot cake, and chocos cereal, for anytime finger food. But you can carry whatever your toddler likes. Just keep it simple and non messy. d. milk powder: baby-foodie has whole milk now, but considering that will be difficult to carry and may get spoiled, I am carrying a carton of lactogen 3. Plus he has a midnight feed, and it is much easier to constitute the milk powder from boiled cooled water, than wondering about the milk scene at 2 am in the morning. I plan to carry 5 scoops of dry powder in a measuring cup, so that he can have milk on bpoard the flight as well. much easier to ask the flight attendant for hot water. e. A few small containers: these will be to stock up food and fruits in the morning breakfast area, so that baby foodie has handy snacks through the day. this guy loves his chocos cereal, carry some of your child's favourite snacks. sugar rush be damned! a. Diapers: he uses 3 /day since he is partially potty trained, but I am calculating 5/day and a few extras.we are going to a place where it might be difficult to purchase diapers, and thus the overthink. 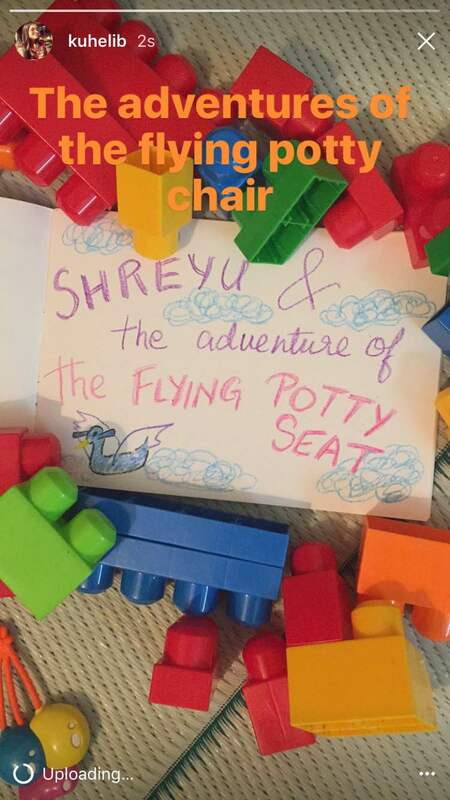 e. Potty chair: now this one was the tough call. The chair is a bulky duck shaped chair, with a neck and snout and hand bars. This meant a whole bag just to pack in the chair. We debated not taking it, debated buying a smaller more travel friendly potty chair, but ultimately decided to take the original along. 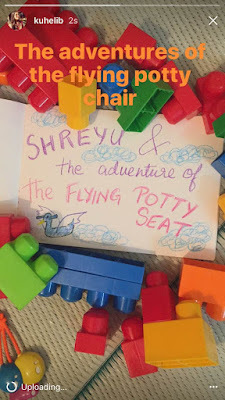 More on the adventures of the potty chair once we return from our holiday. yes, I am planning to chronicle our first international travel with wax crayon illustrations. d. Air blower (optional) to blow up the bigger tubes. Calculating three changes per day. repeated every three days. Which comes to 9 sets of clothes.some extras. Plus two night clothes, if it’s a short trip and three sets of night clothes if it’s a longer trip. Major debate on this as well. but we are planning to take both. Here is why. We start travel in the wee hours of the night and I feel baby wearing a sleeping child will be more conmforting to him. but we have two changes of flight with a 6 hour stop over. 6 hours of carrying an energetic toddler is going to be tough. He loves his stroller, and even though it is 7 Kgs, it can double up as a strapped in chair in which to feed him, at the airport, or even in the hotel room. Even if it buys us an hour of sanity, I am ok lugging around an extra 7 Kgs. (that’s the idea, but more on it once we return from our travel). We went to a fancy restaurant once, and they didn't have any high chairs. baby foodies's stroller came to the rescue. we had a hands free dinner . Well , this is only our first travel, so hopefully I will keep editing this post as we go along. But any and all suggestions are invited in the comments below. Panjim of late has gotten itself a bean bag filled with new cafes.This week we review two of the new beans on the block, Black vanilla and mad hatter’s tea café. While one is owned by a big hospitality company which already owns three food and beverage outlets in Panjim, the other is a small enterprise by a woman entrepreneur ,her first venture into the world of F and B. Black Vanilla: strategically situated next to Crossword book store, this cute and cozy café calls itself a boulangerie as well. The newest venture by Bernard and Bennett, the ones who own enroute and Barrels and Bones, they even have a loyalty card, redeemable at any of their outlets. Artistic paintings of the Eiffel tower, French style windows, and fresh baguettes for sale add to the French appeal of the place. The tree shelf bearing books as leaves on it’s branches is a particularly lovely sight, and a treat for book lovers and writers. They have a host of salads, burgers and open faced sandwiches. The black pepper beef sandwich was recommended . I found the beef quite tender but the marinade had not managed to flavour the meat,the leftovers infact tasted much better the next morning, because of the increased time for the flavours to actually marinate. The prawn and calamari Caesar salad is perfect for a quick lunch on a hot afternoon. The only grouse is that they do not have any crispy croutons in the Caesar salad, hopefully that can be easily remedied. The desserts unfortunately did not pass muster. The red velvet roll, was infact just a red coloured sponge cake. The average Goan who loves to eat out has now evolved enough to know the difference between a sponge cake and a red velvet cake. The cheese cake had a lovely dense creamy cheesy aftertaste, the white chocolate top was inspired, but I felt it was not value for money. They have a nice, if not an extensive cold as well as hot coffee range. The cold mocha was refreshing, with balanced flavours of coffee and chocolate, but I wish it wasn;t served in a coffee mug. Coffee mugs just make me think ‘hot’ coffee, I prefer my cold beverages in tall, transparent glasses. But that’s just me. Pros: great location, cozy ambience, ample parking (opposite the road), open till 11 pm. Cons: average desserts, limited seating,expensive. Madhatters tea café: situated in the bustling road just off 18 june road, this one is on a one way, and is best located through google maps. The place is still a work in progress, with a menu which has maggi and simple sandwiches as the highlights. The quirky theme is what gets people in the door, and the theme carries forward in the posters from alice in wonderland, a photo booth complete with photo props like hats and tea cups. Given the mad hatters love/hate relationship with time, there are a number of alarm clocks and table clocks which add to the ‘mad and quirky’ décor. Yes, there is room for improvement, but one can’t help but realise that there is a personal touch in most things at the café. Food wise, this place is a work in progress, they yet don’t have a fixed menu. All the teas are loose leafed, which is a major plus, considering even the five star ‘tea lounges’ in the city are serving tea bag tea. I ordered the chamomile tea, and it came in a transparent tea pot, I could actually see the chamomile flowers infusing the hot water. The visual in itself was calming and I feel a large part of the tea appreciation experience. The pot comes with it’s very own 3 minute hour glass, and watching the sand slip down while the tea brews into a warm sun kissed auburn shade is an experience I haven’t seen in any other tea café in the city. The tea itself is poured into transparent cups, which works great with the green teas and infusions, but I would love to see some quirky porcelean cups brought from antique thrift stores at the madhatters, especially while sipping on black teas or milk teas. They have about a dozen odd number of teas, which in itself is not many, but since Goa is still waking up to the tea revolution, it is a start. The food as I said is very limited, and I just tried their club sandwich, which was average.The place is aimed at the young, aspirational college goer, and thus the prices are affordable, but I feel given more thought and time, this place could very well stretch out to the more experienced , mature customers, who are knowledgable as well as love their tea. Pros: quirky name and concept , affordable, use of loose leaf tea. Cons: limited menu, hassle to find parking. time is running out, an hour glass, some brewing chamomile tea, and a copy of alice in wonderland kept me company. We were in Times Square, yes that big ostentatious, overly lit, overly crowded, and some might say overly hyped place in possibly the whole planet, but I was loving it. On our stay in new york, we visited Times square almost every night, especially if it waqs a late day at work, we just decided to meet in times square directly from work, and then we would figure out dinner plans. Right from work to dinner, well yes, the Sephora store On tomes square is where I freshened up my makeup with all the try me make up products. And it wasn't just me, every New york woman had had the exact same brilliant idea, and the shop attendees didn't mind one bit. Coming back to the Times square, so as I said we used to meet at times square, and as previously mentioned it was overtly crowded. thus we set a meeting place, the H and M building. for one this place has a huge sign board , you can't miss it, it's easy to see three blocks down as well, for another it has free wifi, and the third -clothes and the perennial sales at H and M.
One of the first stops on Times square was at the Ben and Jerry's icecream store. don't mind that it was stilll winter and as from above picture you can see I was wooled up suitably, but I had heard that bollywood song "paune barah baje..." the mignight tryst with Ben and Jerry's , and I wanted my fan girl moment. They had some really funky flavours, I opted for the tonight Dough starring Jimmy Fallon, which had two flavours of cookie dough, a chcoclate chipa nd a peanut butter variety. loved it! two scoops of icecream , while I shivered even in my woollies. To get away from the cold, we used to try and find interesting things to do in and around Times square, and there are no dearth of such places. one of the most fun was the Madame Tussaud's, a super tip is to get the 10 dollars off coupons the man is distributing right outside madame Tussaud's, it really works! another tip, befriend a couple/family, whose pictures you are willing to take and who will take yours as well, otherwise you are left with no couple pictures. Charlie chaplin just can't figure out what's so funny! Riding off with ET . I met the Man and the icecream on the same day, this happens only in America, and more specifically only on Times Square. Hey Jimmy, did you know I just ate an icecream named the tonight dough? We were in the Big Apple, and nothing says touristy like eating at applebees. we had their much recommended Tacos, they are far from the original, with their pre fried taco shells, but really tasty. It's amazing the number of combo meals America has to offer, and up-sizing your meals. we see it Macdonald's in India, but here they have taken upscaling to a whole new level. loaded with cheese, and deep fried tacos, don't be fooled by the little bits of carrot sticking out, this starter is a must must have at applebees. in school we studied permutation and combinations, i mentally tried to calculate how many, unique combinations we could try on our multiple visits to applebees, with their 2 for $36 plan. we never did return to eat in another applebees, we didn't repeat any food eateries in our entire month's stay. so stay tuned for more food and travel stories from New york. mashed potatoes, steak and brocolli, yes, the picture could have been better taken. But believe it or not I got selfconscious taking food pics .